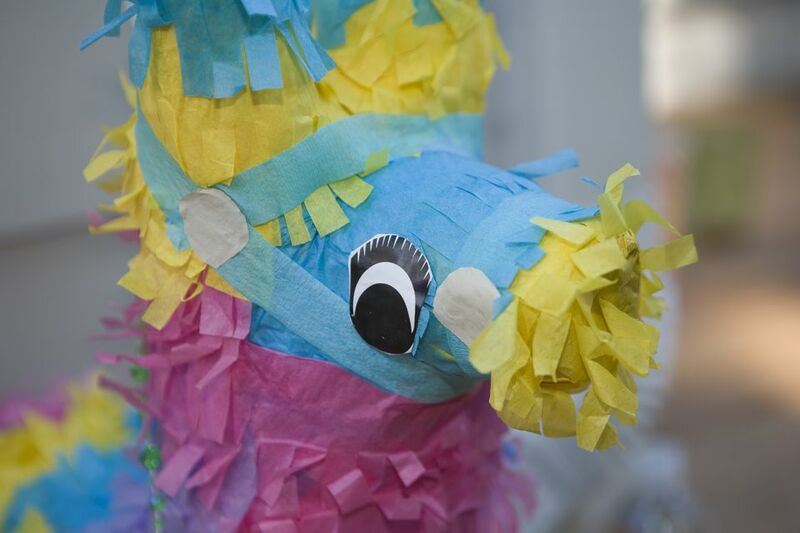 While pinatas are often associated with Mexico, they actually originated in China, where it is believed Marco Polo first encountered paper figures of animals filled with seeds. When the structure was hit, the seeds would fall out and the paper would be burned, its ashes collected to bring good luck. He also is said to have carried the idea to Italy, where it became associated with the celebration of Lent and took on the name pignatta or pot. The tradition traveled throughout New Spain (which included Mexico) and the United States, where it remains a classic birthday party or Christmas amusement. You can carry on the tradition and make one with this very simple design and common craft materials. Paper mache can be very messy so take measures to protect your work surface and anything else the paste might come in contact with. Blow up your balloon as large as it will go. Grab a bowl that your balloon will fit on top of and cover it with plastic wrap. Set the balloon on top of the bowl. Tear several newspaper pages into strips. Tearing rather than cutting will allow them to lay flatter on the balloon. The strips should be about 1-inch wide and 6 to 8 inches long. Set these aside next to the balloon. Choose a paper mache paste recipe. The simplest recipe is the no-cook paste. Make the paste in a glass or metal bowl (it might be a little harder to wash the paste off of plastic). Dip the newspaper strips into the paste you made. Remove any extra glue on the newspaper piece by running it through your pinched fingers. Spread the newspaper onto the balloon. Continue doing so, making the strips go in all different directions until your balloon is completely covered. Make sure you leave a small hole on the end where the balloon is tied so you can remove the balloon and fill the pinata. Let the first layer dry. Add two or three more layers of paper mache to your balloon. Allow each layer to dry completely before putting on the next layer. Once it is dry, pop the balloon and remove it through the opening you left. The fastest to decorate your pinata is to paint it with bright designs. After the paint is dry, hang some crepe paper streamers from the bottom. Consider wrapping strips of crepe paper around your pinata and cutting fringe along the edge. You can also decorate your pinata using squares of tissue paper. To hang your pinata, poke four small holes evenly spaced around the larger hole in the top. Thread a piece of string, yarn or even fishing line through each hole and tie them together at the top. Cover the holes and secure the string further using pieces of masking tape. Tie a longer piece of string onto these and use it to hang up the pinata. Just remember to stuff it with candy or small party favors before you play!